benefits during pregnancy are... reduces stress on weight-bearing joints, increases flexibility, eases constipation, gas and heartburn, reduces excess fluid retention, slows the process of varicose veins and relieves the common discomforts accompanied with pregnancy. A system of ultimate comfort will be used during your session. Our body cushions will alleviate pressure on your neck, breasts, and lower back. You will be able to lie safely and comfortably on your belly throughout your pregnancy-even in your last trimester. Just being able to lie face down will be such a relief you won't want to get up! Maternity Massage support during labor is a wonderful way for your partner to get involved prior to birth. He will be taught specific massage techniques to alleviate your discomfort, prior to and during labor, and pressure points that can induce labor and speed things along. Who doesn't want that!!! It is a very hands on private lesson, where Wendy will give him the tools to make for a quick, supporting, nurturing labor-techniques that he will have forever. It is just as important to get massage after birth as it is during pregnancy. During this time, nature sets about undoing in eight weeks, what took nine months to create. During this time, massage can help you with the physical demands of a newborn, speed the healing process of hemorrhoids or an episiotomy, reduce cellulite, if nursing, help with milk letdown or engorged breast, ease muscle aches and fatigue and reduce swelling in the legs, ankles, feet and other areas of your body. Massage can be helpful and safe during all trimesters of pregnancy. With a few precautions and knowledgeable attention... regular maternity massage may become the favorite part of your prenatal care. Wendy was a Registered Nurse in China for over 17 years… where she nurtured thousand of patients—from the simpler tasks of providing expectant mothers with prenatal care to those recovering from critical heart conditions. Wendy was born in Xi'an, China. 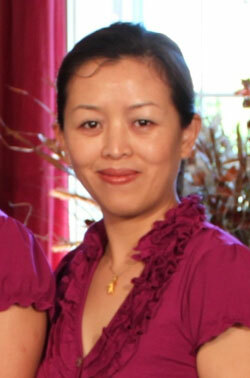 Before moving to American in 2006, she was a Registered Nurse in the Chinese Air Force for more than 17 years. Her skills also include Tui Na, Cai Bei, Chinese Deep Tissue, Swedish, Relaxation, Hot Stone and Post Operative massage therapy. Baby massage is a wonderful way to bond with your baby. It has been proven that infant massage strengthens the immune system, stimulates digestion, relieves gas, reduces colic, promotes restful sleep, encourages proper physical development and so much more! Baby massage can be a very special time spent together and can be just as beneficial for the parent as it is for the baby. One day soon... your baby may be massaging you!